For two discs of animated goodness on Blu-ray, we turn to Looney Tunes Mouse Chronicles: The Chuck Jones Collection. This set provides 19 rodent-related shorts directed by Jones. I’ll look at the cartoons in the order presented here. I’ll provide my own plot synopses as well as quick thoughts and ratings on a 1-10 scale. Naughty But Mice (1939): Sniffles the mouse (voiced by Margaret Hill-Talbot) goes to a drug store for a cold remedy. When he imbibes one with a heavy alcohol content, he finds himself lit – and friends with an anthropomorphic electric razor, which then gets drunk, too. Well, that’s a weird concept for a cartoon – and not a satisfying one. Perhaps with a more compelling lead character, it might’ve worked, but Sniffles is a dud, so the short follows suit. 3/10. Little Brother Rat (1939): Sniffles tries to complete a scavenger hunt that requires him to snag an owl’s egg. 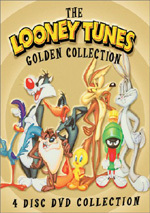 Sniffles appeared in 12 Looney Tunes shorts – and they all appear here. I’m not sure I’ll survive this cartoon death march with my sanity intact. “Rat” is a little better than “Mice”, if just because we get a little Mel Blanc as an owl. That’s minor consolation, though. 4/10. Sniffles and the Bookworm (1939): When Sniffles meets a bookworm, the insect awakens a variety of literary characters who then sing and dance to “Mutiny in the Nursery”. As odd as that concept sounds, it’s not unusual in the world of cartoons, and at least it helps take away much of this short’s focus on the ever-annoying Sniffles. Unfortunately, this doesn’t do a ton to redeem the fairly forgettable short. 4/10. Sniffles Takes a Trip (1940): Sniffles heads to the country in hopes of a relaxing rural vacation. After essentially playing a supporting role in “Bookworm”, Sniffles takes the lead again here, with predictably dull results. Actually, “Trip” works better than most of the Sniffles oeuvre because it milks some decent humor from the mouse-eye view of nature, but the character’s cloying nature continues to prompt demerits. 5/10. The Egg Collector (1940): Sniffles and the bookworm take up egg collecting. A) Didn’t we just see this same story in “Little Brother Rat”? B) “Egg collecting”? Was that ever an actual hobby? This feels like a contrived attempt to place Sniffles with his natural predator and make us hope to see him survive. We don’t, and the fact it self-plagiarizes the earlier short makes me like it even less. 3/10. Bedtime for Sniffles (1940): On Christmas Eve, Sniffles struggles to stay awake to see Santa. Take arguably the cutesiest Looney Tunes character, put him in a cutesy scenario, and what do you get? A sugary-sweet short with little to redeem it. 2/10. Sniffles Bells the Cat (1941): The mice want to put a bell on the housecat so they’ll hear him coming; Sniffles gets stuck with this dangerous task. Perhaps because it threatened Sniffles’ miserable life – or perhaps because of some more-visceral-than-usual animation – “Bells” ends up as probably the best of the Sniffles filmography. That’s faint praise, but this one’s a bit stronger than the others. 6/10. Toy Trouble (1941): Sniffles and the bookworm check out the toys in a department store – and they run into potential harm via a menacing cat. “Trouble” feels a bit like a mix of “Bells” and “Bookworm”, though it accentuates the former’s strengths. With another near-death situation for Sniffles, we get a bit more action than usual and another watchable but uninspired short. 5/10. The Brave Little Bat (1941): Sniffles’ (toy) car dies in the middle of nowhere, so he takes refuge in an old windmill – where he meets a cute and chatty bat. Egads – the combination of Sniffles and Batty means it’s like cuteness squared on display. Batty’s motor-mouth routine is almost amusing, but the sugar overdose of the two adorable leads makes this one tough to swallow. 4/10. The Unbearable Bear (1943): A fox attempts to rob a bear household – and encounters a distraction when he meets Sniffles. When did Sniffles suddenly become as chatty and hyper as Batty? I guess the filmmakers decided to alter his character for this short. It’s a good move, as the Sniffles of “Bear” is less cutesy and more of an active nuisance. Since he always annoyed anyway, it makes sense to turn him into a conscious irritation – and more of a supporting character. 7/10. Lost and Foundling (1944): An egg winds up in Sniffles’ house, so he finds himself charged with its care when a baby bird hatches from it. Sniffles returns to a lead role here, but “Lost” still works better than most of its predecessors. He remains a chatterbox and the hawk he assists adds an unusual charge to the piece. It’s not great, but it’s better than most of the other Sniffles shorts. 6/10. Hush My Mouse (1946): A tough cat demands a dinner of mouse knuckles, so a restaurant needs to find some – and Sniffles is the most obvious subject. “Hush” finishes Sniffles’ reign of terror in a fairly positive fashion. Actually, if he’d been the motor-mouthed supporting character of his later appearances, I would’ve been fine with him; it was WB’s attempts to make him a lovable lead that flopped. “Hush” emphasizes physical comedy and does so with reasonable creativity. 7/10. The Aristo-Cat (1943): After a bratty cat’s antics push his caretaker to quit, he finds himself ignorant of how to survive. Two mice take advantage of his naïveté. The short comes with a reasonable amount of cleverness – and a fun ending. 7/10. Trap Happy Porky (1945): Frustrated by rodents that run rampant in his abode, Porky tries to stop them. He fails and embraces the use of a cat-for-hire as the solution. Plenty of comedy results in this lively, fun short. 8/10. Roughly Squeaking (1946): To keep him off of them, mice pals Hubie and Bertie convince a cat that he’s a lion – and that a dog is actually a moose. The short gets a bit surreal but it’s all well-executed. Mel Blanc’s consistently strong voice work accentuates the material. 8/10. House Hunting Mice (1948): Hubie and Bertie encounter the mechanical “house of tomorrow” and contend with its automatic innovations. It’s nice to see the shorts branch out from the usual cat vs. mouse conceit, and this one uses the technological elements in a satisfying manner. 8/10. Mouse Wreckers (1948): Hubie and Bertie decide to move into a house in which a very good mouse-catching cat resides. They attempt to prompt his departure. While this one returns to the standard cat/mouse theme, it does so with ingenuity and wit. 8/10. The Hypo-Chondri-Cat (1950): Bertie and Hubie sneak into a home filled with cheese. Unfortunately for them, a cat resides there who attempts to evict them. Fortunately for them, he’s a hypochondriac, so they torture him to get their own way. This short works reasonably well, but it feels just a bit stale. Still, it has enough laughs to make it enjoyable. 6/10. Cheese Chasers (1951): Bertie and Hubie gorge themselves on so much cheese that they decide life no longer has meaning. They attempt to commit suicide in the mouth of a cat. That’s a dark premise for a cartoon, but it works in this solid short. 9/10. 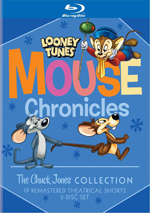 Looney Tunes Mouse Chronicles: The Chuck Jones Collection appears in an aspect ratio of approximately 1.37:1 on this Blu-Ray Disc. Though not flawless, the short usually looked very nice. Source defects seemed pretty modest. I noticed the occasional speck, spot or gate hair, but those instances remained quite infrequent. The shorts maintained natural grain and could display some iffy clean-up animation, but actual print flaws rarely affected the presentation. Colors looked nice. The grain dulled them a little, but not in a significant way, so the hues were mostly vivid and full. Blacks also appeared concise and deep, and the rare low-light shots were accurately depicted. These shorts barely showed their age. Though not as good, the monaural audio of the Looney Tunes was fine for its age. Of course, since the shorts spanned a range of decades, variations occurred, but overall audio quality was positive. Music usually fared best of all, as the shorts’ scores tended to be reasonably peppy and bold. Some distortion could affect the music – especially in the cartoons from the 1930s – but I still thought these elements were pretty clear. Effects fell into the same range; they displayed occasional instances of roughness and never seemed especially dynamic, but they remained generally concise and accurate. Dialogue came with similar variations. Some edginess and boxiness could affect speech, but the lines always stayed intelligible and usually boasted decent naturalness. A bit of noise occasionally accompanied the tracks, but not regularly. In the end, the audio merited a “C+”. Across these, we get historical notes about WB animation and the filmmakers as well as interpretation of the shorts, thoughts about the visual styles, and other related topics. They vary in quality but usually offer pretty good information. Ford’s chats work the best, as he fills those cartoons with lots of useful material; he also lets us hear a little of an interview he conducted with Jones. Beck’s are probably the weakest; they’re still enjoyable, but he narrates the shorts a little too much. Despite that, we learn a reasonable amount across these generally positive discussions. A featurette called Of Mice and Pen goes for eight minutes, 19 seconds. Narrated by voice actor Maurice LaMarche, the program looks at the creation and development of Sniffles and Hubie and Bertie as well as subsequent Looney Tunes mice like Speedy Gonzalez. Expect some basics but not a ton of insight from this mediocre piece. Next we find a Storyboard Reel for The Hypo-Chondri-Cat. This lasts seven minutes, 41 seconds as it shows a mix of final animation and storyboards. It’s a decent way to look at the original planning art created for ths short. Under More Mice, we get 11 bonus shorts. These include The Country Mouse (1935 - 7:04), The Lyin’ Mouse (1937 - 6:59), The Mice Will Play (1938 - 6:55) Little Blabbermouse (1940 - 8:16), Shop Look and Listen (1940 - 7:58), Mouse Mazurka (1949 - 8:05), Mouse-Warming (1952 - 6:59), Mouse-Taken Identity (1957 - 6:40), Mice Follies (1960 - 6:20), It’s Nice to Have a Mouse Around the House (6:44) and Merlin the Magic Mouse (1965 - 6:22). Why are these relegated to the disc’s supplements and not part of the featured collection? Presumably because they feature other directors – Friz Freleng helms most of them. However, Chuck Jones directed Mouse-Warming, so it seems odd that it got stuck in the “bonus” area. I won’t go through all 11 shorts in detail, but I will say that they vary quite a lot in terms of quality. 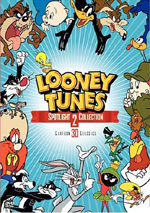 The earliest cartoons are the diciest – Looney Tunes didn’t really hit its stride until the 1940s – but they’re superior to the 1930s material on Disc One, mainly because they leave out Sniffles. The later shorts tend to be pretty good overall; one could easily argue that the “More Mice” cartoons are better than the “main attractions”. Unfortunately, one should expect the “More Mice” shorts to look/sound very good, as they clearly didn’t receive the same restoration as the Blu-ray’s “main material”. Some look awfully soft, while others suffer from rough edges and an unnatural appearance. Colors tend to be flat, and print flaws are more prominent. Audio is closer in quality but still can be more shrill and harsh. The shorts aren’t unwatchable, but they’re a big step down in terms of quality. 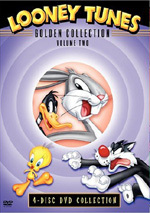 Disc Two opens with ads for The Looney Tunes Show: There Goes the Neighborhood and The Cat in the Hat. Expect inconsistent delights from Looney Tunes Mouse Chronicles: The Chuck Jones Collection. We get a few really good shorts but also find some clunkers, mostly due to the presence of the cutesy “Sniffles” character. The Blu-ray provides very good picture, acceptable audio and a nice set of supplements. While I’m not wild about some of the cartoons, this is still a nice addition to animation libraries.